Today I will make everyone crazy – SORRY? What do you think about Knee Defenders? What is the one topic that is worse than religion, taxes or politics to talk about? No not that; it is seat recline and your right / non-right to do so. 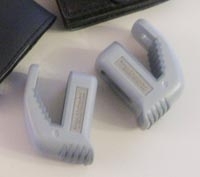 Every day I use my laptop and I feel the screen a little loose from my incident on this trip I hollered about on Flyer Talk, I have been giving thought to trying one of these little puppies called Knee Defenders. I always do so slowly & gently so the person behind me has time to react. I also, as much as I can, pick the exit row ( another reason to get MQM’s from my AMEX Reserve card each year to have status with Delta ) as the row in front of the exit row does not recline most of the time. In the old days, apparently NWA banned them from it’s flights. Delta Air Lines representatives have confirmed to me the airline has no official policy on the gadgets. So my guess is that if an FA tells you not to use them you had better listen to them as they can put you in a WORLD of hurt for not following the direction of an FA ( you could complain later and maybe get some points who knows ). Many of my fellow BoardingArea.com bloggers including Road Warriorette, View from the Wing and One Mile at a Time have talked about this issue before, but as Delta flyers it is good to know that for now we can use these if we should so choose to. I would love to know what Delta Points readers think of this device and the topic in general. How about this. If you are PRO Knee Defender, and I pick your comment via random.org, I will order a set for you and you must agree to take a photo using them and tell us all how it went. If you are AGAINST them, and win the drawing today, I will send you a set of Delta Drink coupons and a GoGo one time pass. Put me on the against side (even though I am 6’2”)–if I pay for a seat, I should be able to recline it all the way. No position on gadgets but definitely anti-recline. Seats should not even have the option. Knees wedged in to seat back during ascent tends to discourage reclining but if it is a problem a co-worker simply started using the top of the seat ahead as a magazine rest when it reclined. Typically resolves issue. PRO – Leg room is at the point of being unhealthy, for some a reclined seat is the difference between stepping of the plane with or without having stowaway table marks in your stomach or not. Also, the speed at which people recline gives you no warning to make sure your face is out of the way. After having seats forcefully reclined into my knees (including once just five days after knee surgery) I’m all for them! That said I ALSO try to get exit rows both for the extra room and inability of the person in front of me to recline. I’ll even take a bulkhead with limited legroom because at least there’s not a seatback in my face! Much as I hate the rapid recliners, the unhealthy leg room issue should be addressed by increased space design. Think how much flight rage will be diminished if we aren’t treated as sardines? On the topic of rapid recliners… I had someone execute the move while we were accelerating for take-off. I reported it to the FA as “the seat must be malfunctioning (wink wink)”. And since I was in an aisle seat I repeatedly used the offenders seat to get in and out. If her headrest is in my lap then leveraging her seat is the only way to get in and out of the encapsulated space. 🙂 That and proper usage of my air vent. Passive aggressive techniques are part of the travel/pack light tools. Neither for or against per se, but I’d only use them if I had a knee injury. In other words, I’d use it for a specific health concern and not merely for comfort. Against. If you don’t want someone to recline into you pick bulkhead or exit row. Against — If i have an issue with someone reclining into my face, they just end up with the air blowing on them, constant grabbing of the seat, stuffing the seat back pocket etc. Usually I’ve been fairly lucky at grabbing an exit row where I don’t have to worry about it. Against. It is my seat and I should be able to control it. against them. I don’t like someone reclining into my space, but i don’t like a tall person sitting in front of me at the movies either. The physical system allows them to do it; I wouldn’t have an answer about what makes me so special as to mechanically stop an allowed process. Kind of sad that it come to this when a little common courtesy would take care of the issue of course we all know that this is something that goes out the window for many people when they board a plane. I’m probably more against the idea of these then for them, it seems to me these have to potential to create additional conflict between passengers. Pro, as I’m against anyone with sense of entitlement. I would classify “Knee Defenders” as a device intended to interfere or tamper with the proper operation of aircraft equipment . In as much as airline seats are safety devices, this cannot be credibly argued against. FWIW, I also have a knee injury and am 6′ 3″ tall. I would also argue that the size and pitch of airline seats must be regulated such that the 80th percentile of US population can fit comfortable in the seats. If the person in front of me is reclining I have no choice but to at least recline a little bit. Not doing so is really uncomfortable and I’d be really angry if the person behind me was using these. i am pro knee defender and violently anti recline. i do not recline out of respect for the person behind me and expect other passengers to extend the same courtesy. in the past, i have propped up my legs and used my femur to prevent full recline. this has led to some low level verbal exchanges but has yet to escalate from there. i would love to try the knee defender. Against! I consider it interfering with the proper operation of aircraft equipment. Regarding a previous comment–As for using the recline feature, when did that become an entitlement? Sorry, I would not approve of these. I am definitely in the camp of “I can put my seat back as far as I want.” However, I will NEVER press the button and slam it back as quickly as I can. I always make a gradual movement in case the person behind me has a laptop open. I also will not recline it unless I am actually trying to sleep/rest. I can’t stand when the person in front of me reclines their seat and then sits up working on their laptop the entire flight. All in all, I just try to practice common decency, which (I’m sad to say) is rare these days, especially on airplanes! If I or you want to recline, then yes do so. But please use manners. Do it slowly and there is NO need on a day flight to fully recline. And to all you tall people, how exactly does recline help your pitch? If your hips are at the back of the seat it is still the same distance to the seat in front of you. Thats hysterical! I’ve never heard of those gadgets before- gotta get me some!!!! I am also against the use of those knee defenders. I am with Nick E on this. There is no need to recline when still sitting upright. When reclining I try to do it slowly. Usually, I don’t recline fully. However, on my last (overnight) flight sitting in an EC seat I was happy to recline a little further than usual so I could get into a somewhat better sleeping position. Against. Even though I have short legs, certain airline seats are bearable only if you can recline a bit. Against. Reclined seats are just part of the overall bad experience in coach. Have to accept it. @boilers, Gasp! Rene is an IU grad!? Against them, I always recline slowly. The airlines put the recline button for you to be able to use it. If not they should make all seats stationary(which I have no problem with). Also I have seen people use the knee defenders and then have their seats reclined? What’s with that! The new seats Delta is putting in some planes don’t interfere with knee room. I think it’s a great idea! Sneaky sneaky sneaky! But I am against them. As much as I HATE when the person in front of me reclines while I am working on my laptop, it is their right. And I don’t feel I should be able to prevent them that right. I can’t see myself ever using these but I did enjoy learning that they exist. Against. I support reclining. Someone being polite or not is another matter. I am against knee defenders. I am 6’2″. If the person in front of me reclines, then I have to recline as well. Otherwise, there is no room for my legs. This is why I do everything possible to attain elite status or upgrade to business. But the real solution is a law which stipulates a human seat pitch. As much as I hate having the seat in front of me end up in my lap, I have to vote against the knee defenders. Sounds like a great way to end up in a flight-long argument with the person in front of you. With my luck, I’d be the one that gets punched out for using them. I am somewhat on the “pro” side, but I would likely only use these on CRJ 200s. I am 6′ 4″ and I have actually had people try to recline their seat over and over and hit my knees and not realize I am in pain until I scream. I don’t mind folks reclining in “real” Delta jets, generally. Against. Seat recline is part of air travel. You have a choice of whether to fly, who to fly, and what cabin of service to fly, and if you can’t handle coach on your carrier, pick another carrier/class/mode of transport. Sometimes you want the seat reclined all the way (think really long flights LAX-DXB, ATL-JNB) and sometimes you don’t (short hop and need to get work done PHX-LAX). I am against that. Talking to the person behind you or in front of you nicely usually resolves the issue about 99% of the time. We are too busy socializing with our smart “devices” than with other human beings these days. I am for…. I love gadgets…. I’m against. As long as the person in front of me doesn’t recline at a ridiculous pace, I’m fine with it. I’m a golden rule sort of guy, though I rarely recline, there are some flights where I just need to get a bit of sleep, and the recline helps. I wouldn’t be happy if the passenger behind me was using these, so I wouldn’t use them either. Against using them. The seats were made to recline for a reason. Against and Delta’s policy should be too. While this has happened to me, and luckily my laptop suffered no damage, I would be horribly upset if someone prevented me from reclining my seat. Against. It’s not my right to take away the functionality from some who has a right to it, even if I don’t like it. I find it interesting that most of the comments here look at it from the other person’s perspective. Smart, thoughtful people hainvg intelligent: there are more reasons than just information to read these blogs. I’m against the use of these devices. I’m also surprised that the airlines and aircraft manufacturers have not found a way to ban these devices because of potential safety issues in the proper operation of the passenger seats. I am against the use of those gadgets. I believe you should have the right to recline your seat, however I have never really felt that I gained anything by having my seat reclined. I am just as uncomfortable in a reclined seat as I am in non-reclined seat. Against, since I feel it’s attacking the problem in the wrong way. We are all sitting in more or less equal seats back there. We purchased our seats knowing a recline is possible and I’d say it’s rather selfish of me to FORCE you not to recline. Sure it may be inconsiderate for a person to recline but I didn’t make the cabin rules so I don’t get to enforce them. HAHA I REALLY upset a guy one day with these! Against, because you’re grabbing space that is intended to be available to someone else. As to the person who said they hate people with a sense of entitlement, really? Seems to me that you feel entitled to space the airline has given to someone else. I’m all for polite coexistence within less than ideal conditions, but as someone with a back problem/sciatica, the ability to change my seat position sporadically means the difference between being able to exit the plane upright, and spending the first 2 days of my trip on painkillers. FWIW, many people use Knee Defender™ specifically to protect their notebook computers from SUDDEN reclines. But then when they see that the person in front wants to recline, they ask for a moment, move their notebook, remove their Knee Defender, and then say, “Thanks.” And then the person reclines. I am against them. I feel that when someone reclines, they need to be aware of the people they are reclining into. I am very much against this gadget. Coach seats these days are cramped enough with the limited recline offered by the airlines. To recline is fine. Just do it slowly. Against the gadget. I have to say, being 6’7″, that when someone in front of me in coach reclines they bump against my knees. There isn’t any way around it, there’s truly nowhere for me to go with my knees in coach. Even with my legs folded, it collides with the seatback. For those that say “tough, get an exit row pal” my answer is that I really do try for one every time I fly coach, it has become more difficult to obtain lately. Generally I’ve had courteous people in front of me that understand when they recline and I mention something. Although interestingly enough, a very short woman sat in front of me about 6 months ago and despite me telling her that each time she strongly pushed back to recline the “stop” of her seatback it was my knees she was banging into, she continued to do so. I guess she needed to feel important, considered it her right, and didn’t have some basic regard for others. Do unto others-wouldn’t it be nice if we could all just get along? Get real. These things are hazardous, and I cannot believe that any airline would allow their use. If some[one] is trying to use one, just alert the flight attendant. I am 100% sure they will inform the [person] who thinks it’s OK to disable another passenger’s seat recline that it’s not OK. I find it laughable that anyone would expect this to be acceptable. Good luck! I’m surprised so many people are against these. I know I’m a day late in comments. I have long legs and a laptop so it bugs me when someone reclines in front of me. I’m not against reclining but I feel the airlines should limit the amount the seats recline for all by about 50%. I know people feel it’s a right to recline way back into another persons lap but really? I would be willing to try the devices just to see how they work but I bet they would not achieve what I would like to see which is a limiter device not a prevent device. I hope this makes sense. I don’t even know why the seats recline anyway. Regardless of class or seat location this is an invasion into the small personal space one is allotted on the plane. Just sit up straight please. I have never heard of these devices however.